Become the bartender everyone wants at their event. Learn how to become a knowledgeable taster. The purpose of A Taste For Drink is to inspire your own beverage creativity not force you to march in lock step with a specific set of recipes. This volume provides you with the tools to make creative decisions rather than simply provide overused templates and recipes identical to a thousand other books that have gone before. A Taste For Drink will quickly become an important adjunct to your arsenal of knowledge. Chock full of tasting technique this book will educate you in how flavors combine and affect your tastebuds. – Learn the proper way to examine and judge your drink. – Learn what makes a good drink good. – Learn why you mix in certain proportions. – Learn how to make flavored syrups to use for coffee, desserts, or alcohol. – Learn to create your own custom alcohol flavors by flavoring base alcohols. – Learn mixing techniques of professionals. A Taste for Drink will quickly become the one source of information that you use to mine your other books for recipes and then deconstruct them to make new and exciting concoctions. Following the advice of an expert on ‘mixing on the fly’ you will learn to identify flavors that complement or counteract each other. You will learn the art of mindful tasting and begin your journey to becoming the Bartender you always wanted to be. Bartenders, home experimenters, and anyone who always wanted to understand why they like the drinks they like will receive benefits from this book. 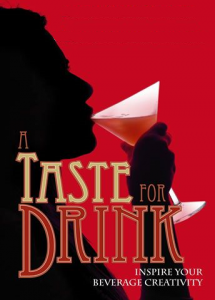 This isn’t a book for posh wine tasters, it’s for the hard (or casual) drinker, the cocktail aficionado, the man or woman who wants to make and drink the tastiest beverages on earth. This entry was posted on November 3, 2016, 7:36 pm and is filed under Books, Drinks. You can follow any responses to this entry through RSS 2.0. Both comments and pings are currently closed.